My review of the Mr. Coffee Café Barista / Oster Prima Latte espresso machine and its clones. Plus a comparison with the Delonghi EC860. This is an OEM product. 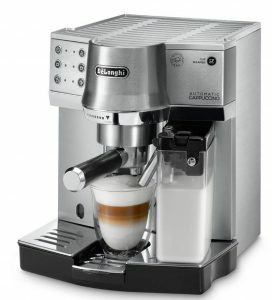 The espresso machine, which is sold as the Mr. Coffee Café Barista in the States, is known in other countries as the Oster Prima Latte, Breville PrimaLatte VCF045/046, Sunbeam EM5000, etc. (see the full list of clones here). All the points in my review also concern these models. November 2018 Update: New Mr. Coffee One-Touch CoffeeHouse, which is for 100% a replica of the Oster Prima Latte 2 appeared on Amazon. I made a separate review of this machine. The Café Barista BVMC-ECMP1000/1102/1106 by Mr. Coffee is an intermediate between classic pump espresso machines (which are usually called semi-automatic, although they require a human’s attention at every step) and super-automatic machines, which can make a cup of cappuccino in one touch (the ESAM 5500 by Delonghi is a great example). The Café Barista can make cappuccino in one touch as well. However it requires a lot of manipulation before (putting ground coffee in the filter and installing the portafilter) and after (cleaning the coffee filter and manually running the milk cleaning cycle). It is indeed a basic espresso maker (like Mr. Coffee’s previous model, the ECMP50) with added electronic dosing and an automated milk frother. 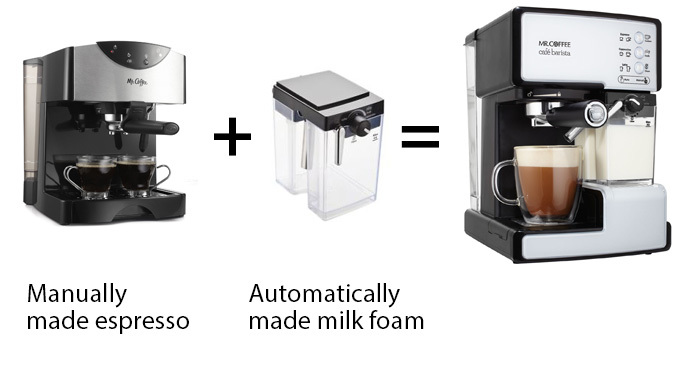 It can automatically deliver espresso shot of the programmed size after making milk foam . These functions really make the brewing process easier, because on average 1 out of 10 people can’t handle a manual milk frother (steam wand aka panarello). Mr. Coffee’s automated milk jug will generate rich milk foam with predictable results every time, as long as it doesn’t break. Nevertheless, these functions don’t make the Café Barista as automated as it may seem. I would like to draw attention to this fact again, because many negative reviews of this espresso and cappuccino maker are based on unrealistic expectations. Other bad reviews are about the low durability, which I can confirm (see below). The ECMP-1000/1102 has a thermoblock as its heating element. It works like electric point-of-use tankless water heater for bathrooms. Coffee snobs will chuckle at this, however it gives advantages for a beginners: less “warm up” time and bigger portions of coffee. If the machine is well heated, the boiler’s capacity is enough to deliver upto 5 fl. oz. (150 ml) of stably hot water. This fact, paired with a 15-bar Italian-made (this much is true) pump, is a necessary condition for good espresso. For better results, it is recommended to wait at least 1-2 minutes after switching the machine on or make one shot without coffee in the filter in order to speed up the heating process. Once the machine is heated and the ground coffee is loaded in the filter basket and tamped, you need to press the upper button once (for a single shot – default factory settings are about 1 fl. oz.) or twice (for a double shot). The machine will stop automatically, which is a benefit of the electronic control system. The standard dosing can be changed – you can program your machine to make a ristretto, which is a smaller and stronger version of espresso or, vice versa, to get a bigger portion for a lungo. Overall, the espresso brewing process is similar to any other pump espresso machine. Still, there are some small differences compared to espresso machines from Delonghi or Saeco. The Mr. Coffee’s crema filter gives rich, good-looking cream foam on top of espresso shots. However, it’s 100% fake – the filter physically makes the bubbles like a faucet aerator does. This is not a negative fact in itself; it just means that rich crema is not an indicator of a good taste in the case of the Mr. Coffee ECMP-1000. The filter construction and thermoblock, which is configured for a slightly lower value than it should be, gives a flatter and more watery taste. It is still decent, but the Saeco’s crema filter gives noticeably better results. However, you are probably considering the Mr. Coffee Café Barista because your main drink is cappuccino. So below I will describe the automatic milk frother that is the key feature of this machine. As I mentioned at the beginning, espresso makers usually have a steam wand (also called a panarello), which is used to froth the milk manually. It is not rocket science and there are various video tutorials on youtube showing how to do it. Anyhow, some people (around 10%, I would say) can’t get away with it. Some other people can, but with unstable results. In both cases, an automated milk frother will help. In the case of Mr. Coffee, it is implemented as an integrated milk jug with a milk foam regulator. Very roughly speaking, it works like a steam-driven milk sprayer. The machine makes espresso and adds it to the cup automatically after making the milk foam. It will produce more foamy milk if the regulator on the milk jug is in the Cappuccino position, or less, if you move the regulator to the left into the Latte position. 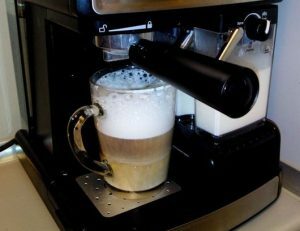 Technically the machine makes latte macchiato in both positions, because in the original cappuccino recipe the milk foam should be added to espresso. While Mr. Coffee BVMC-ECMP1000 adds espresso to the milk foam. However, you can froth the milk separately if you want by pressing and holding the second button for a while. This will allow you to get the “orginal cappuccino”. There could be a pause between the milk-frothing and coffee brewing processes, which is normal because the machine needs time to cool down the water (from ~150°C/300°F that is needed to generate the steam to ~95°C/200°F) . First of all, the integrated milk jug requires a separate cleaning cycle after being used. You will need to put an empty cup under the milk dispensing tube, fill the jar with water, put the froth control regulator into Clean mode and start the cycle by pressing and holding the third button. In my opinion, this ruins all the automation, as the procedure for cleaning this automatic frother is at least as complicated as using a manual frother. The cleaning is important! Without regular cleaning, the frother will quickly stop making good foam. Even one skipped cleaning cycle could be fatal – it’s almost impossible to wash out the old curdled milk. The second problem is the construction and durability of Mr. Coffee’s automated frother. Even when properly maintained, it could stop working within 6-12 months. Just because the construction is too complicated, with narrow tubes and tiny pins that are easy to break. Even European-made milk frothers with similar constructions that are used in super-automatic machines are likely to last only 2 or 3 years. In the case of the Mr. Coffee Café Barista, which is engineered and made in China, the life cycle is much shorter. Numerous reviews prove this. However, I can’t deny the fact that there are people who have used this or a similar machine for years and it still works fine. It’s a lottery. Nevertheless, it is useful to bear this in mind when buying a product with a limited 1-year warranty. There are a surprisingly small number of similar espresso makers on the market. By “similar”, I mean manual semi-automatic espresso machines combined with an automated frother. The main – and in some countries only – competitor is the Delonghi EC860 (not to be confused with the EC680), which usually has a price tag that is 2 or even 3 times higher. There is also a model called the EC850, which is the older version of the same machine. It also has autodosing and an integrated milk jug with similar construction. Delonghi EC860 requires cleaning cycle after cappuccino as well, however it has quick clean function. It means that you don’t need to empty the milk jug and fill it with fresh water – the cleaning could be made when the jug is installed and filled with milk. I also find the EC850/EC860 to be overpriced – you can get a super-automatic machine for a similar amount of money. This pairing requires less messing around, cleaning is easier and it will likely work for much longer. And last but not least, the cappuccino will be better: a cheaper espresso machine with a simple manual frother (see my ultimate test, for example, could give a better espresso, while a good stand-alone milk steamer will make richer and softer foam. Yes, you will need to manually pour the milk foam from the frother to the cup in this case. But I find this much easier than running the complicated cleaning procedure on the Mr. Coffee Café Barista ECMP1106. Sunbeam Cafe Barista Espresso Machine EM5000 (Australia and New Zeland). Vitek VT-1514/1516/1517 (Russia, Ukraine and some of the CIS countries + India). BEEM 1110SR and Silvercrest SEMM 1470 A1 (with a slightly different design, controls). Mr. Coffee One-Touch CoffeeHouse Espresso Maker and Cappuccino Machine BVMC-EM6701SS. In 2017 Oster made an upgrade to Prima Latte. New model is called Primma Latte 19-bar or Prima Latte II (two) and, as for 2018, is available in Canada, Mexico and in LatAm countries (Brazil, Argentinta, Peru, Chile etc). November 2018. Mr. Coffee introcuded new model to American market. Here it is called Mr. Coffee One-Touch CoffeeHouse: see at Amazon or read my new CoffeeHouse Review . Despite the fact that both models – for canadian market and for spanish speaking countries – have the same index (BVSTEM6701) they differ. The key difference is that “spanish” Oster Prima Latte 2 has a second portafilter, which is designed to be used with Nespresso capsules. The machine uses OrignalLine (not new VirtuoLine) capsules and it makes new Prima Latte the first espresso maker on the market that can use ground coffee, ESE coffee pods and Nespresso capsules! Needless to say, that if you aims to use capsules and drink only black coffee, than it’s better to choose simple Nespresso machine (Krups Essenza XN2140 for example). It would be cheaper. 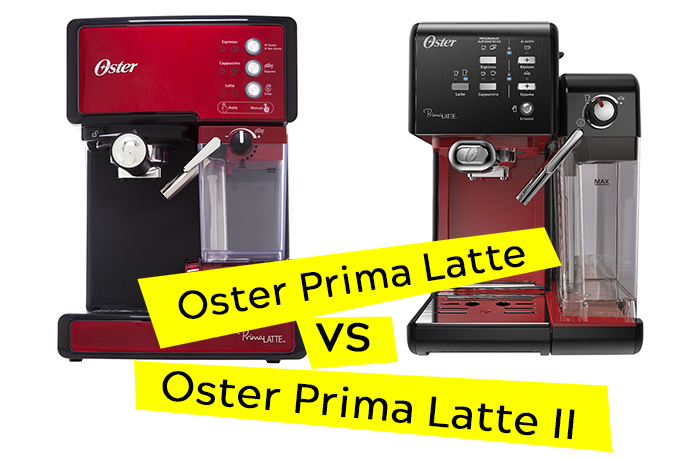 However, new Latin American version of Oster PrimaLatte II could be a more affordable competitor for Nespresso machines with automatic milk frothers (Latissima series). It also could be useful as a cheap universal soultion for a guest house or airbnb apartment. However, I still think that it’s better to choose less automated, but more reliable espresso machine by Delonghi, Saeco or Gaggia. I wish to draw attention one more time – new Nespresso-compatible Prima Latte II is not available in Canada. New pump with a maximum pressure of 19 bar (not 15 bar). Honeslty, it’s kind of useless improvement. In both cases (15 or 19 bar) it is the maximum pressure measured in the pump’s output. Espresso needs just 6-8 bar inside the filter. So both 15 and 19 bar are more than enough for espresso. Just a marketing trick. Increased milk tank capacity (now 650 ml, was 480 ml). Oster claims that it’s enough for 10 cappuccinos, however in practice it’s rather for 7-8. The construction of the milk frother is the same, the milk jug is still need to be cleaned after every cappuccino and that still ruins all the automatisation. In the same time the water reservoir became smaller, which I find to be more critical. New filter baskets. You can use ESE coffee pods now. Plus new filters are separable, which makes it easier to clean them. The width didn’t changed. New Prima Latte 2 looks smaller, however it’s just due to more lightweight design. And the main concern: the complicated “after cappuccino” cleaning requirements ruin all the automation. If you want to buy something affordable to make espressos and cappuccinos, but find a manual steam wand frother too complicated, then buying a simple pump espresso machine and a stand-alone milk warmer and frother (electric, but not handheld) would be a much better solution. The new model for Canadian market is basicly the same as the old one, some bugs of previous model are fixed. However, my opinion is the same as it was about first Prima Latter. If we are talking about Nespresso-compatible Prima Latte II for Mexico, Brazil, Chile and other LATAM countries, than it’s definetly has a killing feature. If you really need a universal machine that could be classic espresso machine and single-serve capsule espresso maker in the same time… then you have no competitors. « Delonghi EC155/156 and EC145/146. They both look the same, so which one should I buy? Review and Comparison. Please tell me which one you would recommend out of these two? or Is there another make/model within the price range that you suggest? Your reviews are very detailed and helpful. I will appreciate your help. As I mentioned in the first sentence of this review, it’s the same machine under different names. You can choose keeping only the price in mind. There is no similar machines (manual espresso + automated milk foam) in this budget. However, as I also mentioned in my review, I personally would rather buy something like Saeco Poemia/Delonghi ECP/Delonghi EC155 plus a standalone magnetic milk frother. There would be less automatisation, however, better dirability and espresso quality. Hi! As far as I know, they (Oster and Mr. Coffee) don’t sell similar replicas in one country officially. So it’s either Mr. Coffee (e.g. USA) or Oster (e.g. Canada) on the market. Thus, the price difference is because on of the machine is sold by sellere from other country ot importer and that’s why it’s more expansive, as I assume. We purchased the Oster Prima Latte 2 (19 Bar) Espresso about a month ago and have been very happy with the results. We have using it both for lattes and espressos and it works extremely well for both. The automatic mode seems to produce a smaller cup of cappuccino that I would prefer even when the larger size is chosen, but, the size can be increased by using the manual mode which works great for frothing and for espressos. The taste is very comparable if not better than the expensive machines used in expensive Italian restaurants (didn’t want to name drop). I have a Cafe Latte 2, and it deprogrammed after two months, i.e. the automatic stop for a single or double espresso (etc.) no longer occurs. It will overflow if I don’t pay attention. Any idea how to reprogram this? Thanks! 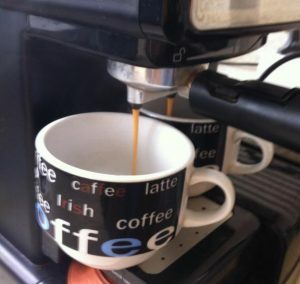 Hi, try to press and hold the single cup button until desirable volume of coffee in your cup, then unhold the button. That is not officially described in the manual, so I’m not sure if it will work, but usually all Chineese machines are programmed this way.